Lecture – Struggle against mining on Apache lands in Arizona: "Protect Oak Flat!" 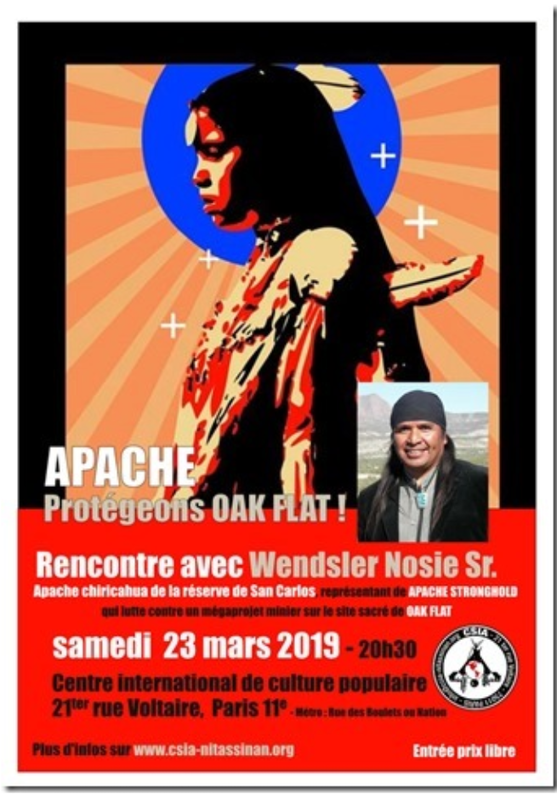 – Meeting with Wendsler Nosie Sr., Chiricahua Apache from the San Carlos Reservation in Arizona, representative of the APACHE STRONGHOLD (Paris, March 23rd 2019). Wendsler Nosie Sr. is a Chiricahua Apache from the San Carlos Reservation in Arizona, he has been Chairman and member of the Tribal Council of that Reservation. He is now head of Apache Stronghold. He is struggling for the cultural rights of his community, as a copper mine project at Oak flats, one hour driving east of Phoenix, threatens this site, sacred for the Apaches, and known as Chi'Ch'il Bildagoteel in Athapasq. In the past, Wendsler also struggled against the extension of the site of a telescope on Mount Graham, 70 km from Tucson, Arizona. Mount Graham is a mountain considered sacred by the Apaches of the Southwest, and is know as Dzil Nchaa Si An.